FIME has continued its global expansion with a new office opening in Dubai’s Internet City, bringing its experts closer to customers in the financial services, transport, government and telecoms sectors. Customers across the Middle East and Africa region have easier access to FIME’s full portfolio of services. Alight at Nakheel Metro Station. 5 minute walk towards Dubai Internet City. 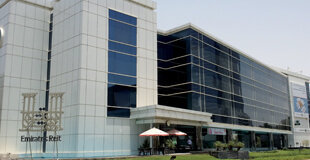 Dubai Islamic Bank is located across from the Radisson Blu Hotel.